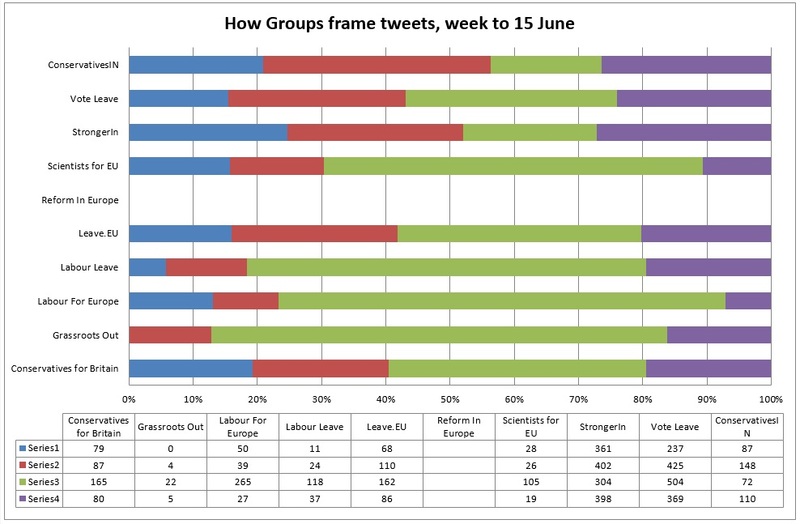 Since January, we have been monitoring the social media accounts of the groups contesting the EU referendum, for both content and the way that they frame their arguments. The killing of Jo Cox on Thursday last week provided a natural experiment of the worst kind, with all sides halting campaigning from approximately Thursday lunchtime to the end of Saturday. With much debate about the tone of this campaigning, there were a lot of words offered all around about the need to take personal attacks out of political debate and instead have a more constructive approach to matters. With this in mind, we have produced this short report to see whether those sentiments have translated into action on groups’ Twitter feeds. We have taken our usual sample of groups and coded for the period up to approximately 0900 on Tuesday morning. in the charts below this block of data is shown as “22/6/16”, even though it necessarily doesn’t cover the whole of our usual week (which runs to the end of Wednesday). More details on methodology can be found in earlier posts. 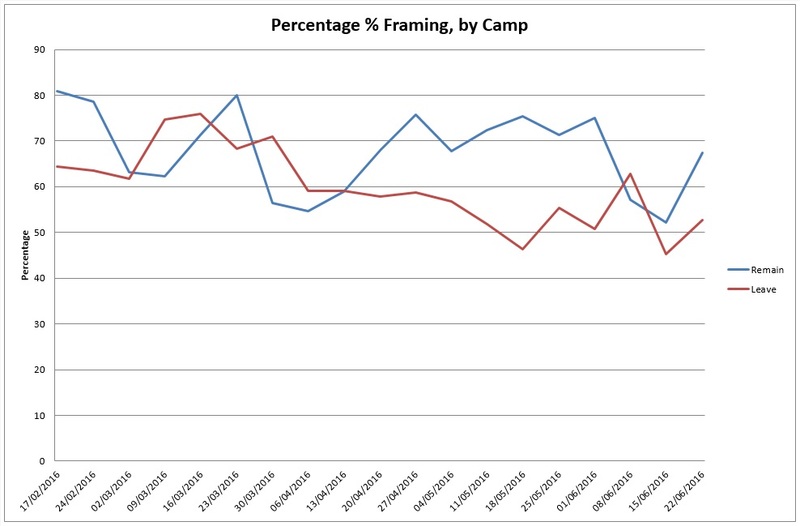 Our first chart shows that – taken as a whole – there has been an uptick in positive framing by both sides. This has happened even though this week’s sample has lost the usual Saturday traffic that we code as positive and which consists of retweeting examples of local campaigning. However, if we disaggregate the camps and look at the three main groups – the official leads of Vote Leave and Stronger In, plus Leave.EU – we see a more mixed picture. 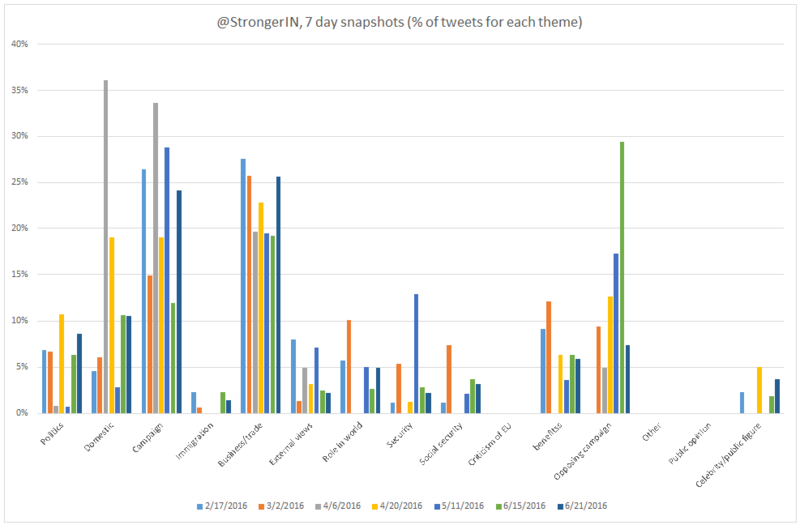 Stronger In has moved in an upward trajectory on positively-framed tweets, while the Leave groups have moved downwards. In addition, while Stronger In has had a very sharp drop in negative comments about other groups, both of the Leave groups have maintained their levels. The reasons for this are probably a function of the media debate since the resumption of campaigning. Since then, David Cameron has had his Question Time appearance, which saw the usual pattern of response by Leave groups. This consists of a mixture of calling out any factual errors and retweeting critical comments from other users, both well-known and less so. This mix has not changed from previous media events. By contrast, there has not been a comparable media event for Stronger In to demonstrate whether they have shifted. 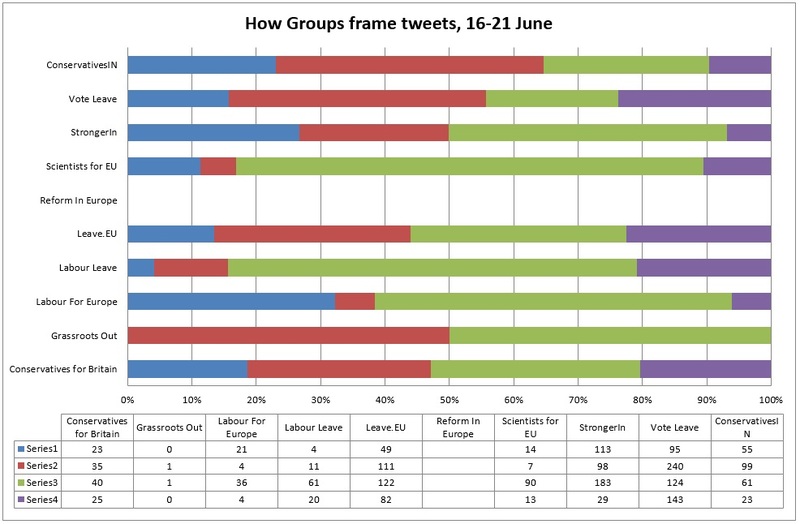 However, we would note that they have previously used less of the retweeting strategy found in the Leave groups, so even if there was no shift, it would be unlikely to lead to a pattern that matches them. If we focus on the week prior to Jo Cox’s death and the period since, we can see that groups have had varying degrees of shift in content. However, we should also note that the sample size is quite small for this week, outside of the big three, so we cannot draw any clear conclusions at this time. In terms of the topics the campaigns are tweeting about, we see some change. Notably, Stronger In have dropped the percentage of tweet about the other campaign from 29% last week, to just 7% this week, representing a 22% drop. Instead, they have direct their efforts to towards their own campaign with an increase in the number of campaign related tweets to 24%, up from 12% the previous week (a 12% increase). 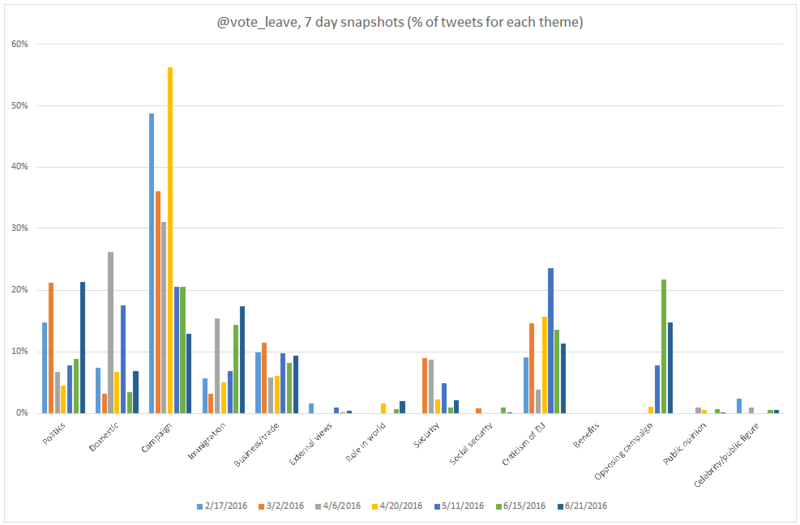 Vote Leave have also dropped the number of tweets about the other campaign from 22% to 15% this week (a 7% drop). 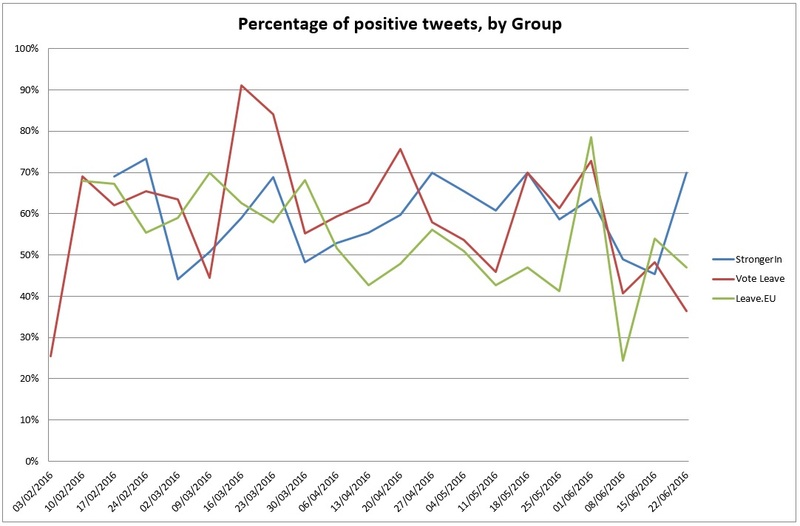 At the same time they have also decreased the number of campaign related tweets from 21% to 13% (an 8% drop). These shortfalls are accounted for in a rise in tweets about politics, up from 9% last week to 21% of tweets this week (a 12% increase). 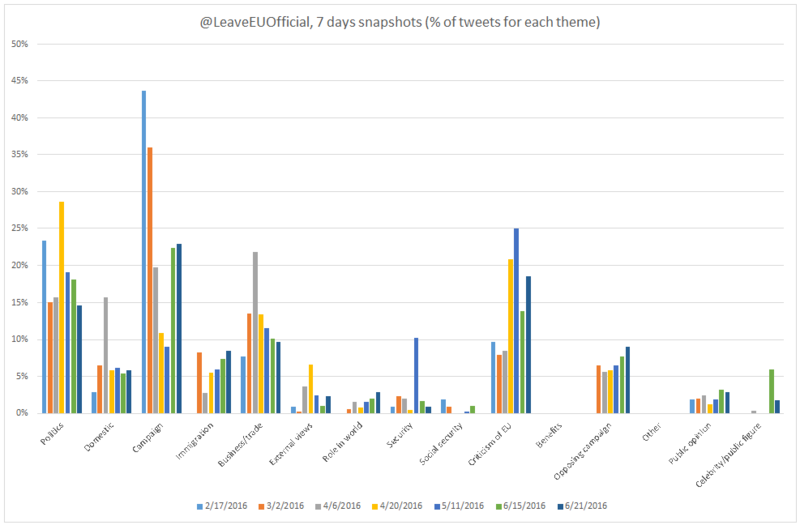 There has been no significant change in the themes LeaveEU tweets about. 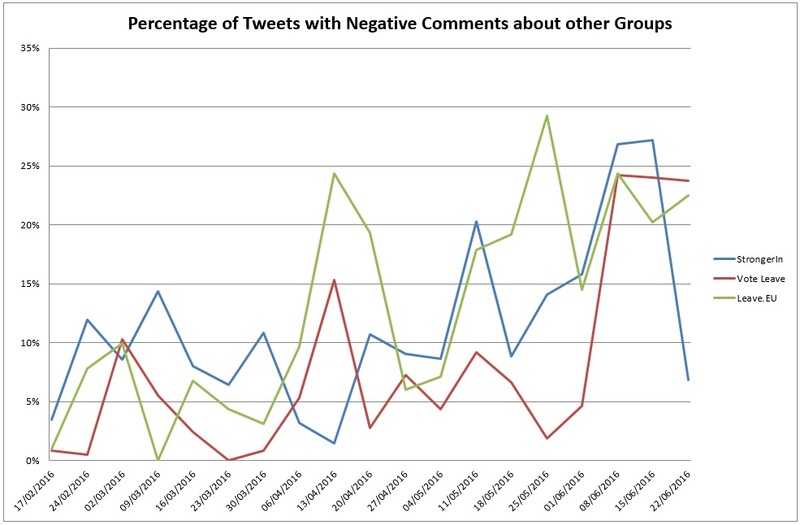 This suggests that the two designated campaigns have understood the call for a more constructive approach to the campaigns to mean disengaging from tweeting about the other group. While Vote Leave have sought to frame more tweets in political terms. In summary, the kind words and rhetoric of the weekend does not appear to have translated into practice, especially in the way that the two main Leave groups handled their social media coverage of a key debate. Whether this changes with the big debates at Wembley on Tuesday and again on Channel 4 of Wednesday remains to be seen.